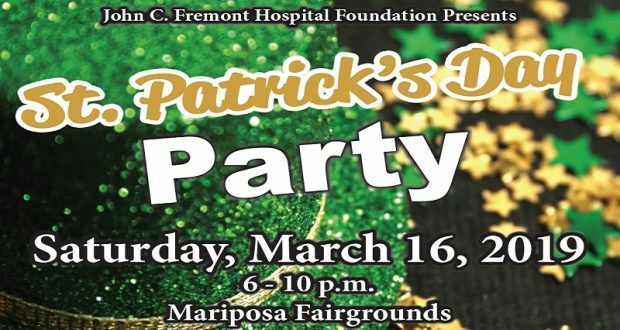 MARIPOSA – The John C. Fremont Hospital Foundation invites the community to celebrate St. Patrick’s Day on Saturday, Mar. 16 from 6-10 p.m. at the Mariposa Fairgrounds. This gala bash will include a traditional Irish dinner with a vegetarian option, plus dancing, a raffle and auction, and no-host bar featuring Irish cocktails, beer and wine. Tickets are $25 for adults, $15 for kids ages 6-12, and kids 5 and under are free. Tickets are available at the JCF business office, the Mariposa Chamber of Commerce, Pony Expresso and online at eventbrite.com. Tickets will not be sold at the door.